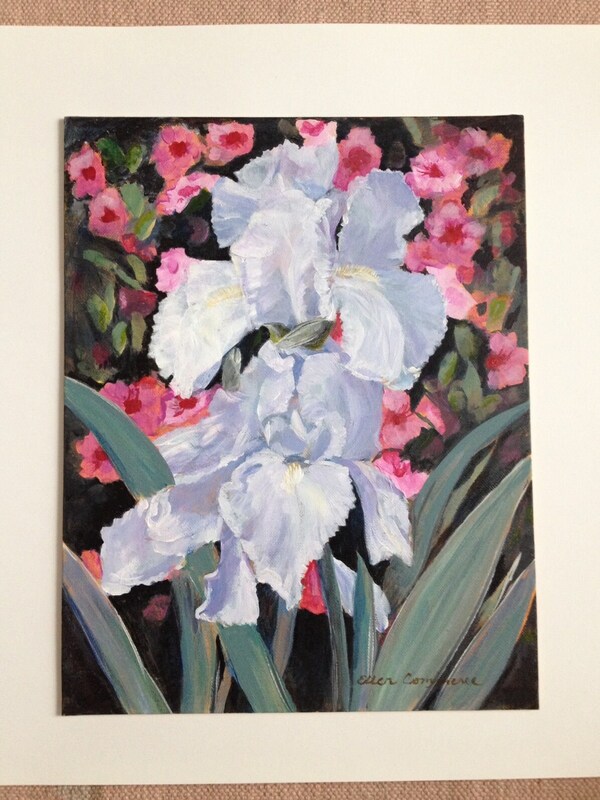 Original painting in acrylics: Two White Irises. Detailed study of the beautiful irises with their rolling blue/lavender shadows. They form the foreground against a less focused backdrop of pink flowers, and behind them, are deep shadows of foliage. 11 x 14 inches. Matte finish. These were from the front garden of a friend's home, in Virginia. They bloomed all summer and well into the fall! She originally transported the bulbs from Colorado. Due to the generosity of my friend, I now have several in front of my house, and can't wait for them to bloom this year! They will hopefully deserve a portrait, too!